This module helps students gain a basic understanding of the elements of the hydrologic cycle. The hydrologic cycle is the continuous movement and phase change of liquid water, ice, and water vapor above, on, under and through the earth's surface. This module examines the basic concepts of the hydrologic cycle including water distribution, atmospheric water, surface water, groundwater, and snowpack/snowmelt. Thank you very much! This is very educational. Kudos! This is a great help to those who want to learn/understand more about "The Hydrologic Cycle." Although I wish that the quiz section have more than 20 questions that needed to be answered.. I don't like that at the end it doesn't tell you what you got wrong and why it is wrong so that I can attempt to go back and gain greater understanding. A good lesson on the basics of Earth's water. pretty easy to learn lesson! 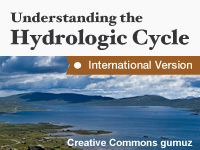 It is a good course to understand the basics of Hydrological Cycle in a very short time. This is a great lesson for non-prior experience user as me to understand basic of hydrologic cycle. Nice lesson for non-prior experience people in hydrologic! This lesson is comprehensive and easy to understand. this course has help me a lot in understanding about hydrology interesting topics for me . It is good to learn and more familiar with hydrologic cycle with its components. Need to review more of the materials. It was fun answering those questions eventhough I failed. This is truly an amazing. It helps a lot to my subject. Add more interesting facts and ideas about the topic related. The lesson here is quiet interesting and it doesn't sounds boring. It’s definitely good and satisfying. It was very interesting and very informative. Following the lessons will give you insight on the hydrologic cycle and water-related ideas. full of excitement and it gain more knowledge . I like the way of learning. This lesson contain a basic knowledge about hydrologic cycle which is very very useful to know and learn about it. An eye-opening and user-friendly course! enriching experience going through the lesson. Hi Greetings ! to all.Happy study this course.all modulues,lessons are well desingend.very user friendly.75% of the lessons are relevant to my career.all the animation are excellent.Hearty congratulations to all technocrat who designed the page,lessons etc.,This course is need of the hour. Very Informative. An Eye opener to topic on Snowpack details. Very practical and will be useful for furthur onwards study. Very useful for understanding the basics of hydrology as each and every topic is covered nicely. Very nicely organised brief of the subject presented here. Very useful information, presented in a well organized manner. The illustrations and language used were pretty straightforward and the concept of the lesson was grasped easily. Would recommend this course to others. It is exciting to use this material in studying general meteorology. It will be a great help for us beginners. Swear! The course has given a lot of insight into the idea of met instrument such as evaporation pan. Helps me answer some question of visiting school students. It is set up in a way that is easy to understand. Very well designed lesson, neither too less nor too more. summary at the end is very helpful in recapitulating the subject matter. Good presentation about basic hydrology, water cycle, Soil-Water interaction, and aquifer yield etc. Basic knowledge about hydrology became strong. Thhe quiz conducted was very useful and helped in understanding the concepts of the hydrological cycle. To score in the quiz one must read and understand the concept and contents very clearly and refer minimum two times to have depth knowledge instead of bit bank question and answer material. It is a great learning tool & technique as it involves lot of pictures along with animations which are very close and similar to the actual and practical aspects and seems real ones. Topics and contents are very well designed,clear & concise without much hard jargons. I thank to tutorials , team leader of national coordinating incident management team and the whole staff for contributing the efforts to present the course. This quiz is a useful material in helping to undertsand the hydrological cycle. Howver too much information to digest and could do with a little less information since the quiz is not testing on all materials given in the tutorials. The time taken to read through the material and make jottings is above my expectation and need to be limited in a sense. However a great learning tool and i would be willing to recommend this information to colleagues and meteorological personnel. The lesson was well organized, clear, concise and well presented with supplemental graphics and illustrations. I found these quiz questions to be a little more focused on minutiae of the lessons, however. Yes it is a good chapter. Its very interesting to learn and recollect once again, hope you all experience the same. This is very useful session to start with hydrology. Interesting .. did not know much about this topic until the study guide. these tutorials are the best, as team leader of national coordinating incident management team, im very proud to be able to take these courses. I have enjoyed reading and then going back to talk about what I just read. Good course but test grading needs some work. Two of my answers did not record that I know I answered. Also, please give correct answers to any that are missed. Great for everyone willing to understand better or refresh knowledges about water cycle. Nice introductory module for beginners and refresher module for experts alike. Great module indeed. It can also serve as a good refresher module at the same time necessary for all professionals at all levels. The contents and the presenation of the module is very nice and helpful in understanding thr topic. Suitable for teaching about the hydrologic cycle in a physical science or earth science class at middle school and/or freshman high school level science class. Great material.